Microsoft, the American software giant, is relentless in its pursuit of those who pirate its products. Over the years, this column has highlighted the company’s modus operandi in bringing to book those Indian companies that violate its copyright and the way it uses Indian courts to fight such cases. Much of it has been unsavoury in the details, but the firm, founded by Bill Gates, has seldom lost a case. For instance, in 2009 Justice Shiv Narayan Dhingra of the Delhi High Court was scathing in his condemnation of what he saw as Microsoft’s use of ªmoney powerº to fight piracy in a way that resulted in the harassment of the companies accused of violating its copyright. With the plaintiff securing ex parte orders, computers of the defendant companies were sealed and businesses were practically shut down in many cases. Due to such tactics, Justice Dhingra had noted, “Defendants, in order to restart their business and lessen their losses, start succumbing to pressure.” As a result, Microsoft’s copyright infringement suits are invariably settled and not contested. 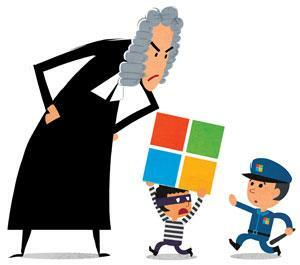 Now, another judge has been even less sparing in his criticism of Microsoft. On July 15, Justice Gautam Patel of the Mumbai High Court pulled up the US corporation for “presenting speculation as fact” and misleading the court into granting an Anton Piller order on the basis of “false suggestions” and “gross suppression”. An Anton Piller order is an injunction that requires a defendant to let the plaintiff enter his/her premises and search and take away material evidence. The order is granted on the basis of an extremely strong prima facie case presented by the plaintiff against the defendant, in this case a company called Girnar Software. Microsoft had alleged that Girnar had a total of 3,315 computer systems and that 1,340 Microsoft Windows programmes were being used on these computers, although the company had bought licences for only 545. Girnar was also alleged to be deploying 1,308 Microsoft Office programmes against licences for just 550. Microsoft had also accused Girnar of being uncooperative in trying to resolve the matter. All this has turned out to be false or rank exaggeration. The raid conducted by the Mumbai High Court’s IT cell found that Girnar had a total of just 1,053 machines, of which only 283 machines were using Microsoft programmes. And damningly, the exchange of emails between the parties that Microsoft hid from the court revealed that Girnar was not being obstructionist in any way. Microsoft, with revenues of US$93.6 billion in 2015, is said to have run dozens of small Indian companies or traders out of businesses simply by getting their computers seized, according to industry sources. The US giant has, in the past, invariably used the Delhi High Court to get its ex parte injunctions, bypassing the courts in the jurisdiction of the companies. Legal experts have been extremely critical of the court for issuing ex parte orders without verifying Microsoft’s claims. Often, harassed traders have settled for amounts much higher than the actual licence fee charged by Microsoft for its products. In this case, too, don’t be surprised at all if Microsoft reaches a settlement with Girnar soon. As for misleading the court, should we expect any penalties?